I haven't slept yet--well that's because I work at night--but I'll be sleeping with a huge grin on my face. Just got an email from Weardrobe that I was chosen to receive their Spotlight Blogger of the Day!!! =) Sweet. On other news... I know I've been ranting and whining about how hard it is to look for a bowler hat here in Manila. And I swear I did what Nina Garcia said in her Style book about sleeping it off when you want to purchase something, and when you still want it the next day then buy it. 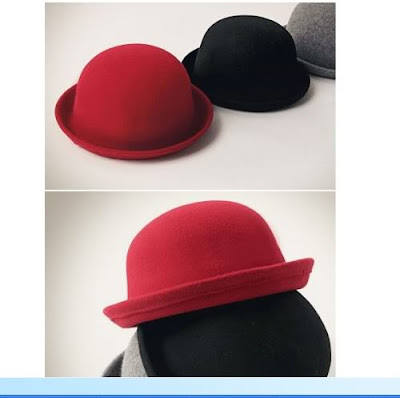 I saw these babies on Ebay and after sleeping it off for weeks, after raking through a number of malls, bazaars and thrift shops, and failing to take home the trophy bowler hat everytime-- I knew I had to get it. Ebay FTW!=) I paid 32 Australian dollars (with shipping) for these babies. But I know it's worth it. Can't wait to get my hands on them! Oh, the agony of waiting. It'll be the longest 2 weeks of my life. Come to mama. Congrats on being featured in Weardrobe!! You totally deserve it! That hat will look fabulous on you! Can't wait to see how you style it! I love these hats, but sadly I just can't pull any type of hat off. Unless if we are talking baseball cap to hid crazy hair. congrats on the feature dear! you totally deserve it! i cannot wait to see how you style that boater hat too! i am just so lazy in updating my weardrobe and chictopia sometimes..hehe. i tend to forget to post my outfits...i envy your consistency...and of course your great style..
can't wait to join your giveaway!!!! Grabe i like the red hat din sis! :D and ginagawa ko din yang "sleeping it off" but mapapanaginipan mo talaga pag di mo kinuha no? :D Hahaha! @Ana - tama!!! lalo na pag wala talaga sha everywhere. Ebay is the place to be. 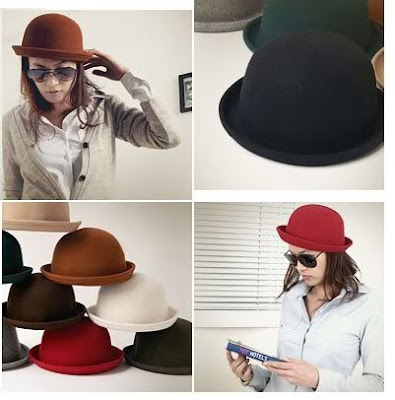 Ah yeah its really hard to find a good bowler hat! Cant wait to see yours. Congratulations for your feature Aisa :) you deserve it!